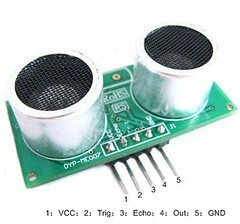 Supply module with 5V, the output will be 5V while obstacle is within range otherwise it outputs 0V. Note : the module should be inserted in the circuit before giving power which avoids chances of misoperation ；if it does not work, power again. (1) IO trigger Pin(2) should be given HIGH LEVEL pulses of at least 10us. (2) The module then starts sending ultrasonic sound of 40khz frequency and receives the pulses if there is any obstacle nearby. (3) If there is signals returning, then the ECHO pin output high level pulses and the following formula is to used to calculate the distance of obstacle. How to send pulses of at least 10us? First of all, make an Arduino Programmer on breadboard using FT232RL breakout board. It is very easy and you can get the tutorial on this link: CLICK HERE.You can also make the project using Arduino board, but if you want to make it independent of Arduino board, I recommend you to make the project on breadboard. The main advantage making on breadboard is that you can later solder the project on PCB. The basic direction for making Arduino programmer can be achieved from the following picture. – Keep IC on breadboard; short pin 1 to GND; short Pin 2 to 6; insert 1M resistor across Pin 6 and 7. – Insert 1K resistor across Pin 7 and Vcc(Power). – Short Pin 4 and 8 and connect Pin 8 to Vcc(Power). – Insert 22p capacitor across pin 2 and 1; and 0.1uF capacitor across Pin 5 and GND. Now the 555 astable configuration is ready. Then Insert URF on the breadboard. Finally the whole assembly would look like this. thanks for expressing your interest. You have a great idea but I am sorry to say that I cannot help you with PIC. My site is about arduino and I can only work with arduino. I strongly recommend you to use Ping))) module to work on your idea rather than SRF04 module because it is better than SRF04. I am always searching online for ideas that can aid me. thanks for this I was loking for something like this, now I’m gonna use it in my project. Throughout the awesome scheme of things you’ll receive a B+ for hard work. Exactly where you misplaced everybody ended up being in your particulars. You know, they say, the devil is in the details… And it could not be more correct in this article. Having said that, let me reveal to you precisely what did work. Your article (parts of it) can be extremely convincing and that is most likely why I am taking the effort to comment. I do not make it a regular habit of doing that. Secondly, although I can notice the leaps in logic you come up with, I am not confident of how you appear to connect the points that make the actual conclusion. For now I shall subscribe to your issue however trust in the foreseeable future you connect your facts better.